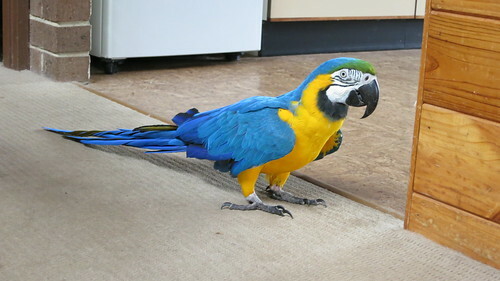 We were obviously beside ourselves in excitement when she informed us she owned a famous and very talkative Macaw. I mean for god’s sake, ‘Tango’ even has an agent! The agent contacts the owner whenever a prospective role is available for ‘Tango’. Apart from starring in movies, ‘Tango’ has had roles in several commercials for different brands such as Freedom Furniture in Australia and McDonald’s in Hong Kong! We made it very clear that we would love to meet ‘Tango’ one day. And so ‘Tango’ dropped in for his much-anticipated visit today. He was happily sitting on his mom’s shoulder when they came out of the car and into our house. His mom showed him around our place so he got a chance to settle into his surroundings. 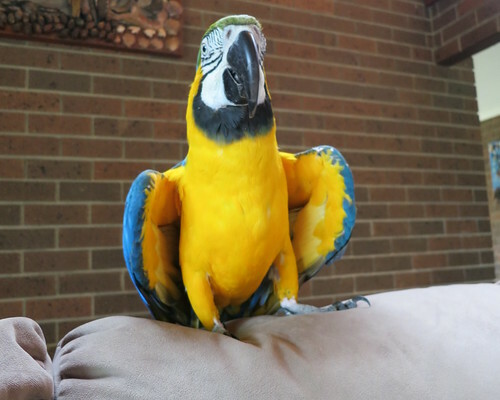 He then sat on the couch while Wally and I stared at him in absolute awe. We offered him heaps of cashew and almond nuts and he ate a couple then made it clear he was full. Check out the video footage and many many pictures we took of him below. We obviously couldn’t get enough of him! 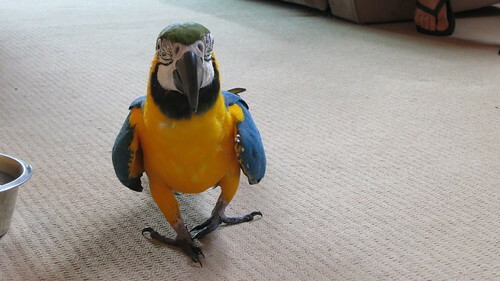 Tango happily prancing around the house. Tango sitting on the couch and getting a photo shoot & yummy treats. 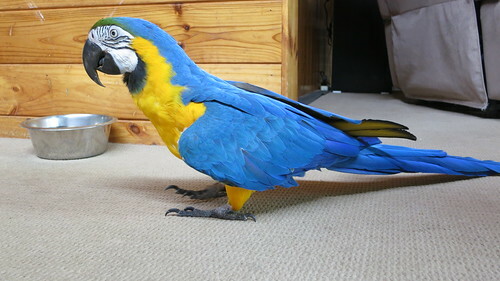 The colours of his feathers were just so vibrant; he was even bigger than we expected him to be. He was quite the mama’s boy. He kept squawking at her for reassurance and attention. Although he is usually a very talkative fellow, he only said ‘Hello’ in front of us. We obviously posed with him. 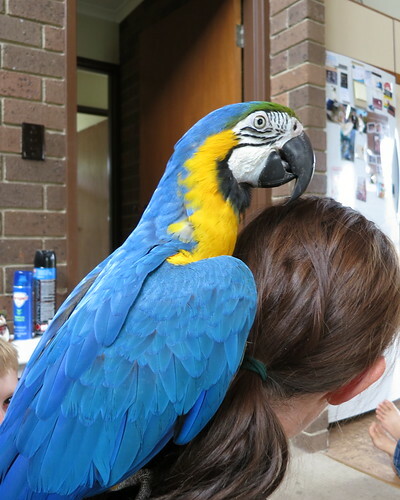 He happily stepped up on our hands and was a very polite parrot. We were advised not to pat him as he doesn’t like strangers doing that. Instead we let him run around the house and enjoy his explorations. After an hour or so, he grew impatient and kept squawking for his mom and making it clear he would like to go home. It was just so beautiful to see the very deep bond he had formed with his owner. He allowed her to lift his wings, pat his tail, and give him head scratches and kisses. We also found out he turned 21 last week! We hope to see him more regularly and establish a good relationship with him. It would be a great day when he finally lets his guard down and starts chatting away in front of us. Don’t we feel lucky! 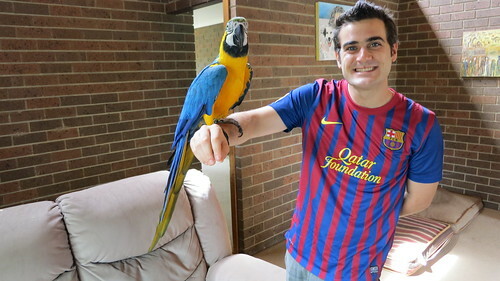 I mean what are the odds of meeting a superstar parrot! Wow, he really is stunning! I know ;-). Can’t believe you are in awe inspite of your bird phobia! Wow, what a great bird! Thank you for documenting his visit. Interesting to hear how engaging he is with people and new surroundings. Fun photos too! Rayya, your hair is gorgeous!!!!!!!!! I use to own a parolette mini parrot only 7 grams he was such a sweetie. Beautiful photos this was a taadaa moment for sure. Thank you for sharing! Oh he died years ago from picking his feathers was very sad. I love the way he tosses his head like a real movie star! He’s certainly got the attitude. What beautiful plumage!! How lucky are you guys!!!!! Im so jealous! Loved the movie!! 🙂 Missing u all…..
Hey Umbilicus. We feel so privileged. You ought to be jealous, hehehe. I bet that was a surprise. Opportunities like that don’t come come along often. 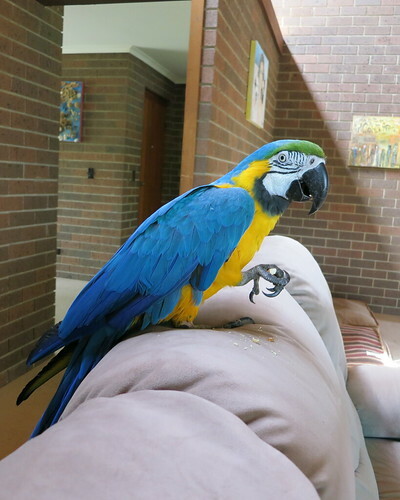 I enjoyed the move and Tango is a nice looking Macaw. Beautiful bird and those colors, awesome! Thanks for sharing. So sweet! 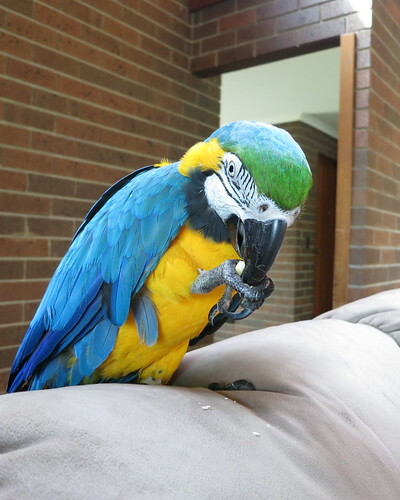 Our zoo used to have a blue and gold macaw as part of our program collection. She was unusual in that she would work for lots of different people. If she liked you. She adored my coworker. Me, not so much. It could take a half hour to even get her out of the cage! Thats so awesome! If only I stayed for the weekend! What a great video, and fantastic photos, it is a shame he didn’t say a few more words, but he was magnificent on his own without words. You were very lucky to be able to meet Tango in person and enjoy this most beautiful bird; his colours are so vibrant, he is just gorgeous! A meeting never to be forgotten, so thanks for sharing it with us Rayya, along with the great video and pics. 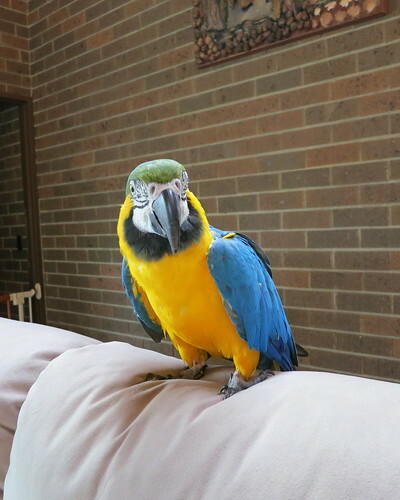 (Love the photos – they are excellent and really show his feather detail). Very cool, I’m not a ‘bird’ person, but that’s pretty cool. You’re forgiven from straying from the script! What a stunner – hope you get to know him better and to talk to him. Glorious photos, thanks so much for sharing! I’ll have to look up that movie. Bravo, Tango! It’s beautiful! I think there are very smart animals! Ah and I also saw a Barça T-shirt! Barça it’s my team!!!! He’s such a gorgeous parrot! I’ll have to go look up the movie! ‘Tango’ sure is a gorgeous fellow and he knows it :-). He has his mom wrapped around his little claw. I think we all like to actually see what happens! 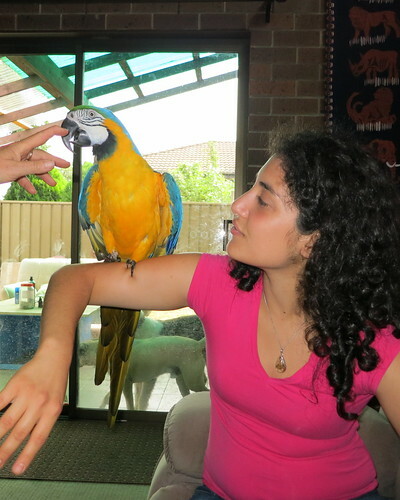 Even if I am personally afraid of parrots…and big animals as horses. Wow this is amazing. I can’t belive I’ve stumbled upon this, I actually knew tango when he was in training and shooting the movie, my uncle, Peter Gregg was his trainer. Its fantastic to see he’s still so beautiful and i definetly agree tango is a great movie. Hey Josh. Tango sure is gorgeous. Your uncle did great work with him. Now Tango enjoys being spoilt by his new family. Hello, Rayya. I just love your blog. 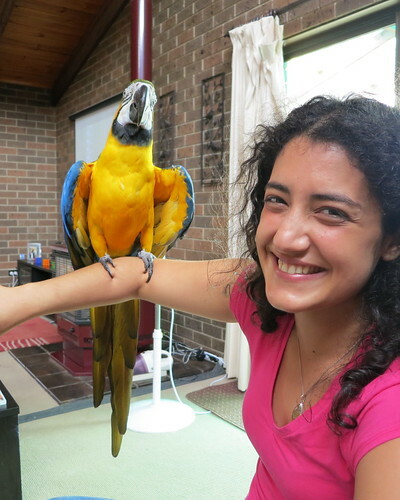 And I absolutely could not resist stopping by to say hello to that adorable parrot. 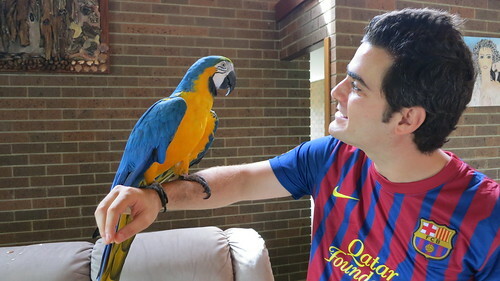 So, Cheers from NYParrot to a Parrot from Britain:)>.